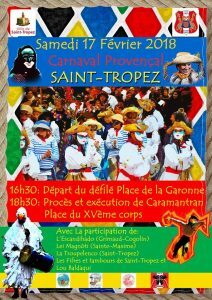 Come along to the colorful Carnival Provencal in St Tropez on Saturday the 17th of February. Discover the traditions of the old provencal culture. See folk and traditional dancing, singing in the provencal dialect. Colorful regional costumes from the 1820 to 1860’s. 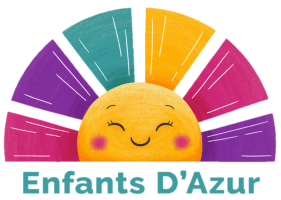 Enjoy the drummers and flutists, brightly dressed harlequins and “bouffetaires”. Bouffetaires have white faces covered with flour, dress in nightgowns with white cotton night hats and march through the town with their flutes and singing old provencal tunes. 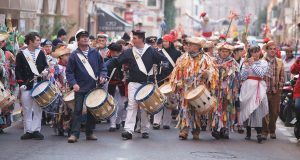 Some participants play “galoubets” which are wind instruments with 3 holes and some come dressed in very distinctive white masks. 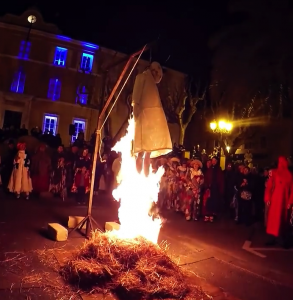 The procession escorts “Caramentran” portrayed by an effigy (rough model or sculpture of a person) to the Place du XVe Corps where his trial takes place before he is publicly executed by hanging and burnt at the stake. A bit gruesome but similar to the British Tradition of burning Guy Fawkes on Bonfire night. “Caramentran” is a traditional character of the Provencal Carnival. He is a sort of grotesque scarecrow dressed in old rags and is supposed to have been accused of being to blame for all the problems in the village. Before his execution he is permitted a trial where the accusations are read out and he is condemned to be hung and burnt. After his execution the ashes are said to contain all the problems and when they are disposed of it all the problems will go with them. You may have heard the French saying “D’etre habillé comme un Caramentran” Which means to be dressed in a ridiculous way. The trial and public execution of Caramantran is at 6:30pm at Place du XVe corps.